It’s small, getting on in years, and sometimes quite busy, but Spring Mountain PA has one huge thing going for it: it’s only 45 minutes from Philadelphia in suburban Montgomery County. Yet Spring Mountain ski resort has more the recommend it than just it’s the closest ski resort to Philadelphia. There’s some good beginners areas, quality ski school, and a pleasant lodge and tavern for apres ski. Expert skiers won’t any terrain to scare them at Spring Mountain ski resort, but the (ambitiously rated) double-black Plummet and single-black Glacier at least have some gradient to get some speed going over the short vertical drop (450 feet, less on these runs). Both are off the Stonehill double chair lift. Next to that, the Rocktop double has a few blue runs and access to Glacier, which shouldn’t challenge competent intermediate skiers. Still, Spring Mountain PA is probably best for beginner and learner skiers. 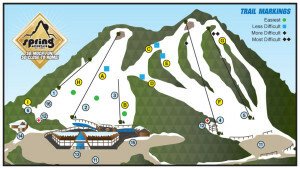 There are several routes down the main Alpine run, and a triple lift serving the gentle fawn run. Skiers on their very first day may find this a little steep, but Spring Mountain ski area also has a magic carpet lift for kids to enjoy the very gentle Mole Hill. Spring Mountain PA Trail Map. Spring Mountain PA is situated near the Schwenksville Hotel (now Woodside Lodge), a 1920s getaway for Philadelphians on a former railroad line. Automotive travel and the spread of the suburbs made vacationing here less attractive by the 1960s, and Spring Mountain ski area opened in winter 1962/63 with just one run (known today as lower Alpine) and a rope tow (since replaced by the Boulder triple chair). After peaking in popularity in the 1980s, Spring Mountain ski area ran into difficulties in the 1990s, and closed in 1999. It was purchased the following year by the Buckman family, who learned to ski at Spring Mountain PA and own a string of ski stores in the area. Spring Mountain ski area was renamed Spring Mountain Adventures in 2006 with the addition of of a canopy tour, rock climbing tower and Geo Caching (a sort of GPS treasure hunt) site. Spring Mountain Adventures has since added to its summer activities with a mountain biking area and to its winter options with a two-run tubing area. The Buckmans bought nearby Woodside Lodge in 2011 and developed a hotel and tavern. But you have compare that to the beinefts of global warming. Hotter temperatures mean more profits for swimming pool operators, A/C manufacturers, and soft drink makers. Shouldn’t we be thinking of the interests of the A/C repair guy and the dude who sells bottled water at the beach?